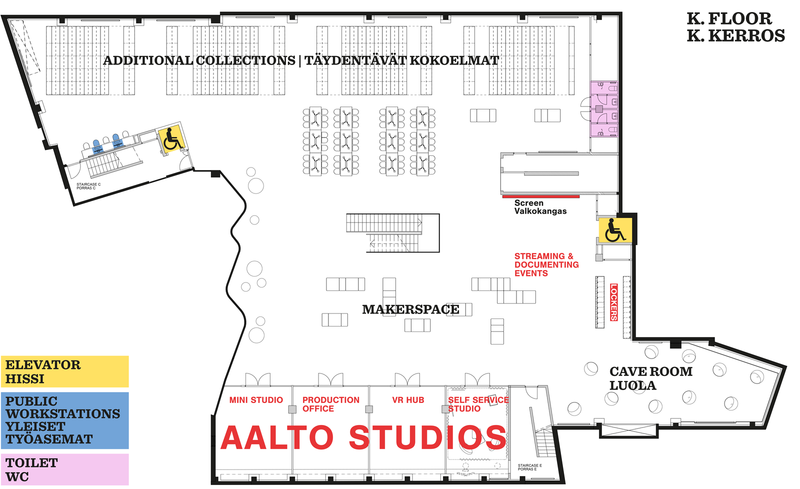 The Studio is located on the K floor, next to Makerspace. It is a self-service recording studio for making video presentations, such as online lectures, interviews, panel discussions or training videos with high quality lighting, sound and easy editing and online sharing. The studio should be booked in advance but is ready to use when you go into the studio. You can either stand behind a speaker stand or sit at a coffee table setting. The recording is done with a program called Panopto that is installed on the studio’s computer. You can include a screen capture in your recording (e.g. Powerpoint slides, web browser, etc). When you have finished your session your video is uploaded to the Panopto cloud server. From there you can use any computer to edit it with your web browser afterwards.